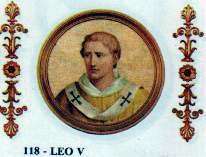 Pope Leo V (died c. February 904) was Pope from July 903 to his death in 904. 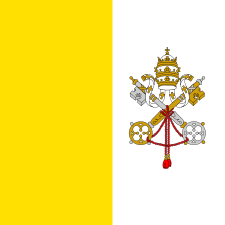 He was pope during the period known as the Saeculum obscurum. He was thrown into prison in September 903 by the Antipope Christopher, and was probably killed at the start of the pontificate of Pope Sergius III. 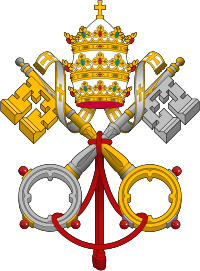 If his deposition is not considered valid (as in the modern Vatican list), then his papacy may be considered to have ended with his death in 904. Leo V was born at a place called Priapi, near Ardea. Although he was a priest when he was elected pope following the death of Pope Benedict IV (900–903), he was not a Cardinal priest of Rome. 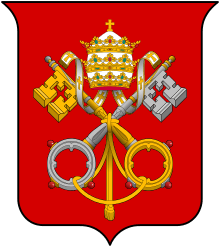 During his brief pontificate, Leo granted the canons of Bologna a special papal bull (epistola tuitionis) where he exempted them from the payment of taxes. However, after a reign of a little over two months, Leo was captured by Christopher, the Cardinal-priest of San Lorenzo in Damaso, and thrown into prison. Christopher then had himself elected pope (903–904), and although now considered an antipope, he had until recently been considered a legitimate pope. If Leo never acquiesced to his deposition, then he can be considered Pope until his death in 904. Leo died whilst in prison. He was either murdered on the orders of Christopher, who was in turn executed by Pope Sergius III (904–911) in 904, or, more likely, both were ordered to be killed at the beginning of Sergius’ pontificate, either on the orders of Sergius himself, or by the direction of the sacri palatii vestararius, Theophylact, Count of Tusculum. ↑ Herbermann, Charles, ed. (1913). "Pope Leo V". Catholic Encyclopedia. New York: Robert Appleton Company.